First of all, I’d like to thank EQ2Wire for giving me the opportunity to rant about…I mean discuss the current situation regarding DPS in EQ2. What I’m going to do here is give 3 rankings and 1 “score” for all DPS classes. Firstly, I will rank where they were. Next I will rank where I expect them to end up after the dust of GU103 settles. Lastly among the rankings, I will include a “value” rank that indicates my opinion of the overall. Finally, the “score” for the DPS classes will be in relation to each other, with the top ranked class being 100, and the rest of the classes being numerically related to my expectation of what % of the damage output they will be compared to the #1 ranked class. We’re all pretty excited for GU103, and I think there is good reason to believe the hard working Dev team has some great things cooked up that will have us dying to plunge right in when the servers come back up on May 9th. Before I give my rankings, let me first throw out a few important points that will help explain the rankings. I include Brigands and Swashbucklers in this list, even though I do not consider them to fall under what the EQ2 Dev Team believes to be “Tier 1 DPS”. I do this because I think that overall, Brigands and Swashbucklers have occasionally slid up into these categories when one or two T1 DPS classes were particularly weak. In addition, I factor in physical damage vs magical damage issues in Tier 4 Raid Content. 1) The upcoming Orange Rune from the wrapping up of the Signature Questline will help mages more. This should come as no surprise, as while scouts are improving nicely on their Ethereal Fervor rune, mages will be improving incredibly as they had no rune at all in this slot. 2) There are supposedly some balance changes that will go into GU103. Most likely candidates for fixes are Wizards followed by an equal chance for some love for Warlocks and Assassins. There is an outside shot that Necromancers, Swashbucklers and Brigands also get some love, in decreasing order of probability. There is a good chance (unfortunately) that some/all of the strongest Tier 1 DPS classes see a bit of a down-turn in their dps as well. Most likely candidates for this would be Rangers seeing a reduction in power for their Epic 2.0 Hawk, although I could see a bit of a drop off of the Conjuror pet. Beastlord’s MIGHT see a slight hit on their primals, but I think that is the least likely target, due to the amount of work involved in such changes. 3) Tier 4 physical vs magical damage issues should be cleared up as part of the GU103 launch. This will also boost mages and hurt scouts in the rankings, as the damage is being “normalized”, which will likely result in a loss of dps for some scouts. 4) I’m probably wrong. Even though I’m really never wrong, I am probably wrong. Things happen. Sometimes an attempt to balance a class completely swings the pendulum so far in that classes favor they go from bad to amazing overnight. Sometimes an attempt to avoid such a pendulum swing causes the balance change to have a negligible effect. Sometimes there just isn’t the time to get the balance changes needed. There are a lot of unknowns as to how much will change, especially considering balance changes are technically slated for the expansion, not GU103. Dev’s need to eat and sleep too, and sometimes even get paid! Rationale: Right now, there simply aren’t any difficult AOE fights where a Swashbuckler’s DPS potential could shine. Their group reset is amazing. However, due to major increases to Fervor, Maurauder’s Vaunt is going to be significantly less significant than before. Their max-health debuffs don’t stack with Brigands and almost every raid is going to prioritize bringing a Brigand. In a bit of a tough place currently. Rationale: They’re not likely to be getting any help with the balance changes. They were in a fairly good place for value before, and their debuff package is likely going to keep them as a desired class. However, they’re likely to drop off in value against T4 mobs due to the reduction in physical damage. Overall in a good place, but not strong enough to justify including more than 1 in an ideal 24-man raid build. Rationale: While the boosts with the Orange Rune and T4 damage changes will help, other than an extremely unlikely massive overhaul to balance (or a change to Focused casting which is NOT going to happen) there just isn’t enough time to make the fixes to this class to have it compete with the top of the parse on any sort of sustained fight. They do have value when you consider mana regen and left-side buff to group beneficials, but they don’t fit well in a raid spot more tailored to a pure DPS toon. Rationale: I’m betting on a “full fix” to Fiery Blast. However, I’m also betting that it will only affect class spells and will not be able to account for Ascension spells, or will only be able to record 1 Ascension spell. As a result, Wizards will improve and leapfrog Warlocks, but their inferior utility package will keep their real value to the raid as the lowest among the classical Tier 1 DPS classes. However, if Fiery Blast is somehow fully fixed and fully accounts for Ascension spells, Wizards jump to #2 on my DPS Rank. I just don’t see that happening. Rationale: Assassins seem like they’re in line to see a little love, but my gut tells me not much will change for them. However, I do think they’ll be improved enough that a raid will be better off having 1 Assassin and 1 Ranger over 2 Rangers. Especially considering hate transfer and max health debuffs. If they get anything better than a modest boost from the balance changes, they will skyrocket in value, even if they’re not grabbing the top dps spot. Rationale: Rangers seem most likely to get hit with a nerf bat. Specifically with their amazing Epic 2.0 Hawk pet. As a result of this along with the likely fact that changes to T4 mobs may hurt Hawk DPS even without a nerf, I’m anticipating a bit of a down-tick in the Ranger class. Not enough to put them in a bad position, but enough that they’ll likely top a lot less sustained parses. Rationale: I think Beastlords won’t actually see much in the terms of being nerfed. However, the changes to T4 mechanics and the fact that mages will simply make up a lot of ground with Orange Runes is enough to drop the Beastlord out of the universally accepted top DPS spot. They’ll still be good, and they’re still versatile in a pinch, but they won’t be a cut above the rest anymore. Rationale: Summoners seem most likely to get the biggest love out of the Orange Runes, because they were already on decent footing. However, Necromancers simply don’t have as good of an Epic 2.0 pet right now, and as a result, almost everything the Necromancer can do, the Conjuror can do better. At least they can rez! Rationale: Conjurors will be king. Why? They were already in a good place, and the Orange Rune is going to really let them shine. In addition, there is a great chance they’re the Tier 1 DPS class that will see the greatest benefit from the upcoming cloaks later in June. Beyond that, they’ve still got a little bit of utility to go along with their huge numbers. As a result, expect to see some really big numbers out of your favorite Conjurors. This should be an exciting GU. I think class balance will remain an issue, but I am optimistic it will take a step in the right direction. The Dev Team has a ton on their plate, but they still manage to put out a lot of great quality and are generally extremely receptive to feedback and suggestions. Congrats in advance to them on a great GU. See you in Norrath! And… chanters? I know that a lot of top guilds don’t use them. Don’t we need some love? Badly?!!! I’m not sure why you include scout utility but not mage utility. Chanters definitely need some help this expansion. I don’t agree with all of your rankings but I do think your general notion that warlock and wizard need help and that scouts will be hurt by the new adornment are pretty accurate. I think the bigger balance issue atm is healers; chain heals are ridiculous compared to leather and plate. It’ll be interesting to see what changes the update brings in that regard. Every time healer balance is attempted by “reining in” shaman, the results are…sub-par. Witness the walking back of wards not critting as well…I’ll let others speak to the bleedthrough mechanic (full disclosure: raids as a defiler). Bottom line, healer rankings are as much a function of how incoming damage is structured, and if that isn’t adjusted it’s hard to see how you can further adjust healers without unintended negative consequences for everybody. Not asking for a chain nerf, just a boost to leather and plate. Seems like plate is doing ok now, at least with orange adorn. From what I hear, leather got the shaft even more. And an SK nerf. Ah well. At least they put out the Orange adorn and heritage ear at the same time so people can blow up the experts and feel good even when they’ve been nerfed. Truly, one could take the fact that I don’t list chanters on this list as an indication that their dps doesn’t typically fall in the range of the top 9 as a good indication as far as where they sit in regards to their dps potential. However, Coercers fit the mold of classic “Tier 3” dps, whereas Brigands and Swashbuckler’s have historically been “Tier 2”. And yes, there are changes coming to both traditional utility classes and healers we’ve been told, so it will be exciting to see where those changes take us. From a balance perspective, don’t think Summoners should be top tier DPS. Never have. Why play a Sorcerer? You know what’s crazy to me? Most of my characters are still ToV equipped. 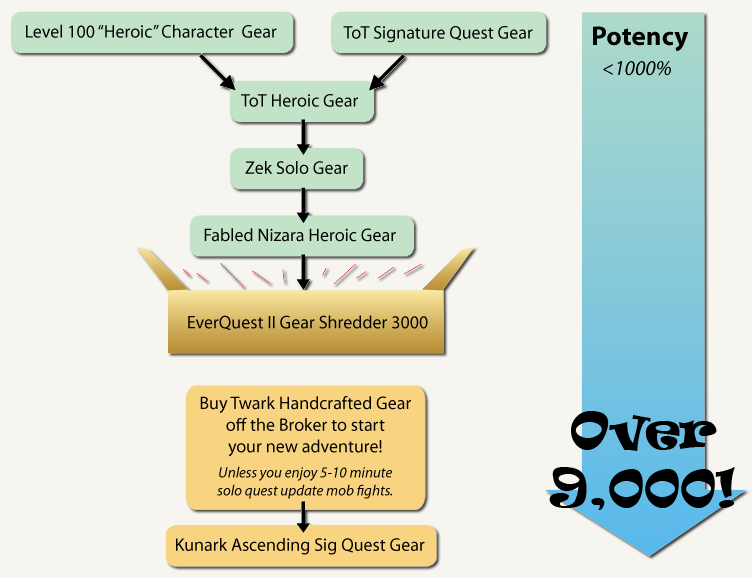 The gear difference between that expansion to the current expansion is like a 5000% increase. That is absolutely insane. It was funny that Mogrim was actually able to get anyone to post this, considering he rants the majority of the time how he loses to utility/healers and yet there are no utility/healers above warlock ranks. He doesn’t understand how the summoner classes work. To say they obtain so much from the fervor rune is actually laughable. I suppose that people don’t remember the swarm pets were nerfed to only receive 63-75% of the multiplicative stats, which includes fervor. Let’s use base 200 fervor cap for this example. If I cap at 200% fervor, the pets will only receive up to 150 fervor max. Mogrim considers the summoner abilities Communion and Undead Horde as their main burst abilities. Communion has a 1minute cooldown and Undead Horde has a 5minute cooldown, both receiving limited stats. Those who receive full value on their abilities whenever the rune procs will receive the most value. Summoners aren’t one of those as most of their “burst” will be swarm type abilities. People considered summoners to be in a good spot before the GU. It probably put them closer to rangers, whereas conjurors became closer to beastlords. This article is about as relevant and useful as Warlocks. The soul of this game died when Sony gave up on it. I still love it but watching it die slowly has been torture. The players in the game are amazing still with all the let downs, but they have yet to realize that saying one class does more dps than another is like saying a type of running shoe will always win a foot race or even has the potential to. So… 2007? SOE had barely any connection to Sony. By “Sony” I meant SOE ofc. But yeah SOE was somewhat of the forgotten stepchild. Still mad at you Feldon for not making EQ2Wire forums though! It’s ok. Nobody else noticed that I launched forums. Or they did but don’t use them.